You can honor the life of your loved ones with the purchase of a leaf to be placed on our Leaves of Life tree. Help our tree grow while honoring the memory of your loved one(s) with a donation that will help improve the quality of life for other residents and families. The Villa’s Tree of Life is a large handcrafted oak carving hanging on a wall located in the Central Lounge. 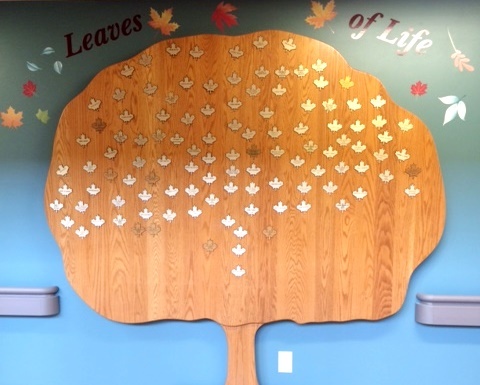 The Village’s Tree of Life was incorporated into the Donor Recognition Wall with a portion dedicated to remembering your loved ones. Loved one’s names will be inscribed onto a leaf, which will then be placed on your choice of Tree and live on in our hearts and home forever. This commemorative leaf will be placed by you and your loved ones, during a special personal ceremony. We invite you to help fill our Tree of Life with the name(s) and memories of your loved one(s), today. For more information or to place an order for a leaf, please call 506 643-7110 or order below.